Welcome back to our Study Skills series – where we've got the tips and knowledge to help you develop your academic skills and become a top-class distance learner. This time we're looking at how to find and use sources successfully in your academic assignments. Why do you need sources anyway? Even if you're the cleverest person in the world, you still need to refer to other people's work when writing assignments. You can't let the reader think these words and ideas came from you. That would be bad news – don't do that! Scroll down to watch the video and learn what to do! So, let's imagine you've found some really good material that you want to use in your assignment. What next? How do you use this material in your work? Most importantly, you always need to acknowledge the source. But how do you refer to someone else's work in your writing? Let's find out. Watch the video and see if you can answer questions 1, 2 and 3. You can check your answers – in an activity – later on this page. What information do you need to include when you refer to someone's work in the TEXT of your assignment? What information do you need to include in the list of information at the END of your assignment? 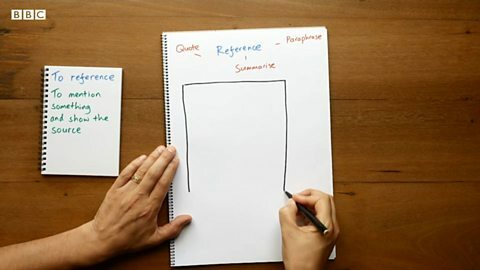 What are the key features of these three types of reference – paraphrase, summary and quote? Even if you're the cleverest person in the world, you still need to refer to other people's work when writing assignments. And you need to acknowledge the source. You can't let the reader think these words and ideas came from you. That would be plagiarism, which is bad news. So, let's imagine you've found some really good sources. What next? How do you use these sources in your work? Most importantly, you always need to reference the source. You do this whether quoting, paraphrasing or summarising. We'll look at those in a moment. But first off, how do you reference someone else's work in your writing? You can give a short reference in the main text, like this, including the author's name and the year the source was published. And at the end of the essay you include more information about the source material. For example: author's name, year of publication, title and chapter of the book or journal, publisher, place of publication. What to write varies among different institutions, so check your own requirements. "The rich consume little more than the poor, and in spite of their natural selfishness and rapacity… they divide with the poor the produce of all their improvements. They are led by an invisible hand…"
Quite long isn't it? And complicated. So we can summarise it. We take only the main ideas and express them in a shorter form. "… and thus, without intending it, without knowing it, advance the interests of the society, and afford means to the multiplication of the species." "The rich are led by an invisible hand to make nearly the same distribution of the necessaries of life… among all its inhabitants." "Smith (1776) believes an unseen force guides the wealthy, which ensures wealth is shared out almost equally in society." See how the words changed? And we also changed the grammar. For example, from passive voice to active. Remember, your writing should always be as clear as possible. "Adam Smith's view is that the wealthy "are led by an invisible hand", which ensures their wealth is shared out through society." But be careful not to rely on quotes too much. You should use them to back up your point, not to make the argument. Remember to use your own words to make the main point, and then use the quote as evidence. And, if you're being asked to discuss, evaluate or compare, remember to include alternative points of view. There we go. Follow these tips to help you write strong essays and avoid plagiarism. After all, you are the cleverest person in the world. Get your references, paraphrasing, summarising, and quoting right! Questions 1 and 2 asked about the information you need to include in references A) in the TEXT and B) at the END of your assignments. Check you've understood everything with this activity. What information do you need to include with your in-text references and in your reference list at the end of your assignments? Check what you've understood with this sorting activity. It's useful to know who published a source you have referenced, but do you include this in-text or in the reference list? That's right! You need to include information about the author's name of sources you reference, in both in-text references and your reference list. Sorry, that's wrong. You need to include information about the author's name of sources you reference, in both in-text references and your reference list. That's right! You need to include information about the year of publication of sources you reference, in both in-text references and your reference list. Sorry, that's wrong. You need to include information about the year of publication of sources you reference, in both in-text references and your reference list. That's right! You need to include page numbers if you are using a quote in an in-text reference. You might also need them in the reference list if you are referencing a chapter in a book or an article in a journal. Sorry, that's wrong.You need to include page numbers if you are using a quote in an in-text reference. You might also need them in the reference list if you are referencing a chapter in a book or an article in a journal. That's right! You need to include the title in the reference list, but not in the in-text reference. Sorry, that's wrong. You need to include the title in the reference list, but not in the in-text reference. That's right. The information about the publisher should be included only in the reference list. Sorry, that's wrong. The information about the publisher should be included only in the reference list. 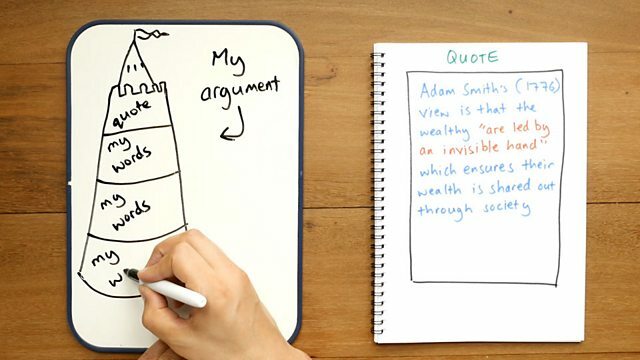 Check your understanding of paraphrasing, summarising and quoting with the activity on the next page.